Anopheles funestus s.s., one of the major malaria vectors in sub-Saharan Africa, belongs to a group of eleven African species that are morphologically similar at the adult stage, most of which do not transmit malaria. The population structure of An. funestus based on mitochondrial DNA data led to the description of two cryptic subdivisions, clade I widespread throughout Africa and clade II known only from Mozambique and Madagascar. In this study, we investigated five common members of the Anopheles funestus group in southern Africa in order to determine relationships within and between species. A total of 155 specimens of An. funestus, An. parensis, An. vaneedeni, An. funestus-like and An. rivulorum from South Africa, Mozambique and Malawi were used for the study. The population genetic structure was assessed within and between populations using mitochondrial DNA. The phylogenetic trees revealed three main lineages: 1) An. rivulorum; 2) An. funestus-like clade I and An. parensis clade II; and 3) An. funestus clades I and II, An. funestus-like clade II, An. parensis clade I and An. vaneedeni clades I and II. Within An. funestus, 32 specimens from Mozambique consisted of 40.6% clade I and 59.4% clade II while all 21 individuals from Malawi were clade I. 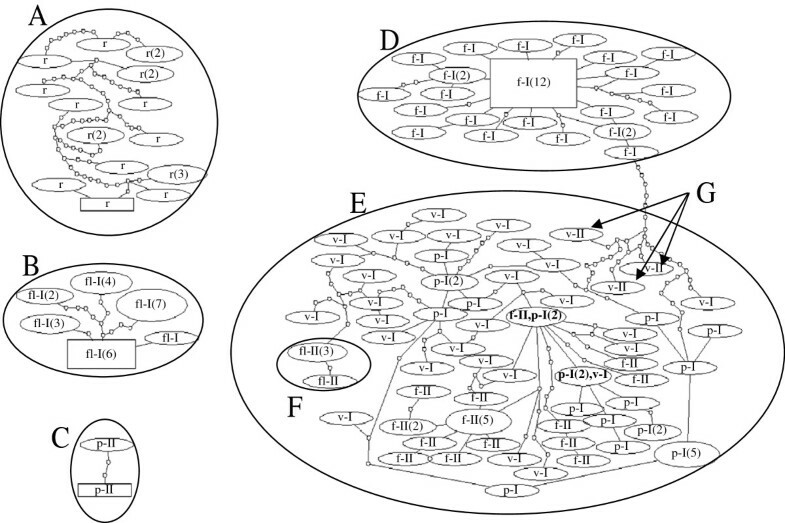 In the analysis of mitochondrial DNA sequences, there were 37 polymorphic sites and 9 fixed different nucleotides for ND5 and 21 polymorphic sites and 6 fixed different nucleotides for COI between the two An. funestus clades. The results for COI supported the ND5 analysis. This is the first report comparing An. funestus group species including An. funestus clades I and II and the new species An. funestus-like. Anopheles funestus clade I is separated from the rest of the members of the An. funestus subgroup and An. funestus-like is distinctly distributed from the other species in this study. However, there were two clades for An. funestus-like, An. parensis and An. vaneedeni. Further investigations are needed to determine what these results mean in terms of the specific status of the clades within each taxon and whether this has any epidemiological implications for malaria transmission. Malaria due to Plasmodium falciparum is a major cause of morbidity and mortality in children and pregnant women. The World Health Organization estimates that there were 216 million malaria cases in 2010, with 655,000 deaths . Malaria also poses a risk to travelers and immigrants, with imported cases increasing in non-endemic areas . The treatment and control of malaria has become more difficult with the spread of drug-resistant strains of parasites  and insecticide-resistant mosquito vectors [4–6]. Depending on the vectorial capacity and competence of local mosquitoes, transmission intensity of human malaria varies across Africa. Only a limited number of Anopheles species are able to transmit Plasmodium malaria to humans  and Anopheles funestus Giles is one of the three major malaria vectors in Africa. It is the nominal member of a large group of mosquitoes that consists of at least eleven African species that are morphologically similar at the adult stage [8, 9]: An. funestus, An. funestus-like, An. vaneedeni, An. parensis, An. aruni, An. confusus, An. brucei, An. fuscivenosus, An. rivulorum, An. rivulorum-like and An. leesoni[7–11]. Anopheles funestus is the most anthropophilic and endophilic member of the group , while the others are mainly zoophilic and not involved in malaria transmission except for An. rivulorum, which is a minor vector in Tanzania  and An. vaneedeni which is a possible vector under laboratory conditions . Anopheles funestus and An. rivulorum are widely distributed throughout sub-Saharan Africa [7, 9]. The extent of the distribution of the other members in the group is largely unknown or they are more localized. Anopheles funestus-like has so far only been recorded from Malawi  and An. rivulorum-like occurs in Cameroon and Burkina Faso but might extend to western and central Africa [9, 14]. Anopheles parensis is found in eastern Africa, Swaziland and South Africa. Anopheles confusus is distributed in eastern and southern Africa and An. vaneedeni is found in South Africa. Anopheles aruni, An. brucei and An. fuscivenosus are extremely rare and found only in Zanzibar, Nigeria and Zimbabwe respectively [7, 9]. A recent study of An. funestus population structure based on NADH Dehydrogenase subunit 5 (ND5) mitochondrial DNA data  led to the description of two cryptic subdivisions, clade I which was found in all 11 African countries sampled and clade II found only in Mozambique and Madagascar. These two clades were differentiated by two fixed differences and an average of 2% divergence, which was thought to indicate that they have evolved independently for ~1 million years. Michel et al. [15, 16] also reported the existence of at least one main division between populations of An. funestus on the basis of microsatellite allele frequencies. Furthermore, digestion of the internal transcribed spacer region 2 (ITS2) in the rDNA using restriction enzymes showed several different “types” within An. funestus[17, 18] (see  for a review of the molecular systematics of An. funestus). Understanding the characteristics of the species in the An. funestus group is necessary for effective malaria vector control programmes. The group may well be as complex and problematic as the An. gambiae complex [19, 20] given the results that we have from only the few population genetic studies that have been done to date. The aim of the present study was to expand previous work by examining inter- and intra-specific relationships between the five most common members of the An. funestus group from southern Africa (An. funestus, An. funestus-like, An. parensis, An. rivulorum and An. vaneedeni), using mitochondrial markers and phylogenetic analysis. Sampling information for the five species used in this study is given in Table 1. A total of 53 An. funestus specimens were collected resting inside houses from Mozambique (n = 32) in 2004 and Malawi (n = 21) in 2001. The collection of 26 An. parensis, 30 An. vaneedeni and 19 An. rivulorum specimens from South Africa were from outdoor CO2-baited traps between 2002 and 2008. The 27 An. funestus-like specimens from Malawi were collected resting inside houses in 2007 and F1 progenies from the specimens were used for this study. Different collection methods were used depending on the biology of each species to try and maximize species diversity. All specimens were identified to species by standard rDNA PCR methods [11, 21, 22]. DNA samples were extracted from either single mosquitoes or available parts of mosquitoes using standard extraction protocols . The modified primers for ND5 were from Michel et al. and the primers for COI from Simon et al.. The sequenced region for ND5 was confirmed with the data from Michel et al. . The region was amplified using primers New ND5F (5′-AGA AAT CAA TAT ATA GAA GAA GAT T-3′) and New ND5R (5′-TTC GAA TAT CTT GAG AAT TTT T-3′) for ND5, and C1-J-1718 (5′-GGA GGA TTT GGA AAT TGA TTA GTT CC-3′) and C1-N-2191 (5′-CCC GGT AAA ATT AAA ATA TAA ACT TC-3′) for COI. A total volume of 50 μL for each reaction contained 1 μL of the genomic DNA of an individual mosquito, 1X PCR Buffer, 2 mM MgCl2, 0.2 mM of each dNTP, 0.4 μM of each primer, and 1 unit of Taq DNA polymerase. PCR cycling conditions for ND5 were as follows: a 5 minute 94°C denaturation step followed by 30 cycles of 45 seconds at 94°C, 45 seconds at 46°C and 1 minute at 72°C; there was a final extension step of 10 minutes at 72°C. Thermal cycling conditions for COI were initial denaturation at 94°C for 3 minutes, 35 cycles of denaturation at 94°C for 30 seconds, annealing at 48°C for 40 seconds and extension at 72°C for 30 seconds, and then a final extension at 72°C for 10 minutes. A total of 155 DNA samples were sent to Macrogen Inc. in Korea and sequence analysis carried out using an ABI 3730XL DNA analyzer (Applied Biosystems, Foster City, CA). The DNA sequence data were aligned in Bioedit 7.0.9 . The sequences were deposited in GenBank under accession numbers JQ424478-JQ424787. Sequence polymorphism and nucleotide divergence with Jukes and Cantor distance (K) statistics were estimated using DnaSP 5.0 . Phylogenetic relationships for construction of a haplotype network were assessed using the statistical parsimony method implemented in TCS version 1.21 . Neighbor-Joining (NJ) analysis was conducted using MEGA 4.0 . Node support for NJ result was assessed using 1000 bootstrap pseudo-replicates. To find which substitution model best described the evolution of concatenated ND5 and COI sequences, Modeltest  was used to perform a hierarchical likelihood ratio test. The Tamura Nei model  was specified for concatenated ND5 and COI sequences using the Akaike information criterion. The model, TIM3 + I + G was used for maximum likelihood analysis using PhyML 3.0 . The primer sequences were not added to the analysis due to unclear primer sequence data from some of specimens although the results were not affected. Alignments of partial sequences from the 3′ end of the ND5 (682 bp) and COI (524 bp) genes were analyzed from 155 individuals of An. funestus, An. funestus-like, An. parensis, An. rivulorum and An. vaneedeni identified using the Spillings et al. and the Koekemoer et al. methods (Table 1). All 21 An. funestus individuals from Malawi belonged to clade I while An. funestus from Mozambique showed the presence of both clades - 13 (40.6%) for clade I and 19 (59.4%) for clade II. The An. rivulorum results were distinct from the rest of the group and this species was used as an outgroup in subsequent analyses. The concatenated sequence data of ND5 and COI were analyzed using a statistical parsimony method  to construct an mtDNA haplotype network (Figure 1). Five main clusters emerged. The three clusters which contained An. rivulorum (Figure 1A), An. funestus-like (Figure 1B) and two An. parensis individuals excluded from the main An. parensis lineage (Figure 1C) were separated from the An. funestus subgroup lineages. The other clusters consisted of two lineages. One cluster included An. funestus clade I (Figure 1D). Mosquitoes included in clade I were within five mutational steps from the ancestral of clade I. The other cluster including An. funestus clade II (Figure 1E) was composed largely of haplotypes from An. parensis and An. vaneedeni as well as four An. funestus-like individuals (Figure 1F). There were two shared haplotypes: a) between An. funestus clade II and An. parensis; and b) between An. parensis and An. vaneedeni in Figure 1E. Anopheles funestus clade II samples were separated by multiple mutational steps from the clade I cluster. The cluster that contained the three An. vaneedeni haplotypes was located between the clade I and II clusters of An. funestus (Figure 1G). Haplotype networks of mtDNA ND5 and COI concatenated sequences. Haplotypes are represented as ovals, scaled to reflect frequencies. The most frequent haplotype (n = 1 in An. rivulorum, n = 6 in An. funestus-like, n = 1 in An. parensis excluded from the main An. parensis group and n = 12 in An. funestus subgroup), inferred as ancestral, is represented by a square. Lines connecting haplotypes and small ovals indicate one mutational step. A: An. rivulorum; B: An. funestus-like; C: An. parensis excluded from the main An. parensis group in clade II; D : clade I in An. funestus; E: clade II in An. funestus, An. parensis clade I and An. vaneedeni clades I and II; F: An. funestus-like individuals excluded from the main An. funestus-like group; G: An. vaneedeni individuals excluded from the main An. vaneedeni group. f-I: An. funestus clade I; f-II: An. funestus clade II; fl-I: An. funestus-like clade I; fl-II: An. funestus-like clade II; p-I: An. parensis clade I; p-II: An. parensis clade II; r: An. rivulorum; v-I: An. vaneedeni clade I; v-II: An. vaneedeni clade II. Haplotypes marked in bold are shared between species. Figures in brackets are frequencies for each haplotype. Sequence alignments of An. funestus (GenBank access No. DQ127052 for ND5 and No. AY423059 for COI, specimens originating from Burkina Faso and Cameroon respectively) were used for the comparison in the phylogenetic trees. The concatenated sequence data of ND5 and COI (total length 1206 bp) for the haplotype network and phylogenetic analysis are presented due to similar results with the individual data for both genes. The concatenated sequence data were analyzed using NJ analysis (Figure 2). Again the taxa were arranged in three distinct lineages: 1) An. rivulorum, 2) An. funestus-like clade I and An. parensis clade II, and 3) An. funestus clades I and II, An. parensis clade I, An. vaneedeni clades I and II, and An. funestus-like clade II. In An. funestus from Mozambique and Malawi, the results confirmed the two subdivisions, clade I and clade II. Four An. funestus-like and two An. parensis individuals that were excluded from the main species lineages (clade I) were designated An. funestus-like clade II and An. parensis clade II. Three An. vaneedeni specimens, which were separated from the main lineage (clade I), were designated An. vaneedeni clade II although they were included in the An. funestus subgroup lineage. The excluded samples were sequenced to confirm the species identification. Neighbor-joining tree. The tree inferred from the concatenated ND5 (a) and COI (b) loci with bootstrap percentages for 1,000 replicates and An. rivulorum as an outgroup. Bootstrap values under 70% are not shown. A: An. rivulorum; B: An. funestus-like clade I; C: An. parensis clade II; D : An. funestus clade I; E: An. funestus clade II, An. parensis clade I and An. vaneedeni clades I; F: An. funestus-like clade II; G: An. vaneedeni clade II. For the NJ tree of the An. funestus subgroup, An. funestus clade I was separated from the rest (An. funestus clade II, An. parensis clade I, An. vaneedeni clades I and II, and An. funestus-like clade II) with bootstrap values of 99%. Anopheles parensis clade II and An. funestus-like clade II were separated from An. funestus-like lineage (clade I) and An. parensis lineage (clade I) with bootstrap values of 99% and 97% respectively. Within the An. funestus subgroup, An. vaneedeni clade II was separated from the main An. vaneedeni lineage (clade I) with bootstrap values of 85%. The ML results are similar to the topology of the tree for the NJ results (Additional file 1). In the An. funestus group, An. rivulorum, which is the nominal member of the An. rivulorum subgroup, had the highest divergence from the other species while the nucleotide divergence with Jukes and Cantor distance (K) for An. funestus-like clade I was also high compared with the rest of the group (Table 2). Anopheles parensis clade II was separated from the An. parensis clade I (0.037) and close to An. funestus-like clade I (0.02). Table 2 shows a nucleotide divergence value of 0.023 between An. funestus clades I and II. The K values of An. funestus clade II against An. funestus-like clade II (0.008), An. parensis clade I (0.005), and An. vaneedeni clade I (0.006) were lower than the ones for An. funestus clade I against the same clades (Table 2). However, An. vaneedeni clade II had the same values (0.016) for the nucleotide divergence from both An. funestus clades. There were 9, 27 and 20 fixed different nucleotides between clades within An. funestus, An. funestus-like and An. parensis respectively (Table 3). Within the group, the highest polymorphic sites were found in An. vaneedeni clade I (34), and the highest number of fixed differences (27) between clades of An. funestus-like. Samples sizes are 44 (An. funestus clade I), 19 (An. funestus clade II), 23 (An. funestus-like clade I), 4 (An. funestus-like clade II), 24 (An. parensis clade I), 2 (An. parensis clade II), 19 (An. rivulorum), 27 (An. vaneedeni clade I) and 3 (An. vaneedeni clade II). The sequence analysis of COI between species in the An. funestus group and between each two clades within An. funestus, An. funestus-like, An. parensis and An. vaneedeni supported the ND5 sequence analysis although the different nucleotides between clades within An. vaneedeni were 0 for ND5 and 3 for COI (Tables 2 and 3). In the COI sequence analysis, the nucleotide divergence between An. rivulorum and the other species was slightly higher than the values from the ND5 sequence analysis (Table 2). The nucleotide divergence values (K) were 0.019, 0.042, 0.039 and 0.017 between clades within An. funestus, An. funestus-like, An. parensis and An. vaneedeni respectively. Polymorphic sites for COI between clades were lower for An. funestus (21), An. funestus-like (27), An. parensis (23) and An. vaneedeni (22) than the ones for ND5 (37, 37, 29 and 36 respectively) (Table 3). Comparison of our data with the COI data of Garros et al. showed that the limited samples of Garros et al. (2–3 specimens) all fell within the main lineages described here, i.e. An. funestus clade I, An. vaneedeni clade I, An. parensis clade I and An. rivulorum. The phylogenetic analysis of concatenated ND5 and COI genes showed the existence of three distinct lineages for the five investigated species, i.e. 1) An. rivulorum, 2) An. funestus-like clade I and An. parensis clade II, and 3) An. funestus clades I and II, An. funestus-like clade II, An. parensis clade I and An. vaneedeni clades I and II. The results presented in this study support the hypothesis that there are at least two main divisions within An. funestus which is consistent with the results of Michel et al. as well as the An. funestus-like study . Previous studies of the ITS2 and D3 regions of the rDNA and COI and Cytochrome Oxidase subunit II (COII) mtDNA genes, for African and Asian Anopheles groups [32, 33] showed that the An. rivulorum subgroup was clearly distinguished from members of the An. funestus subgroup (An. funestus, An. parensis and An. vaneedeni). Although there were slight differences in distances between members of the An. funestus subgroup reported in the two studies, the results reinforce the conclusion of distinct distance between An. funestus and An. rivulorum subgroups. Garros et al. suggested that An. rivulorum, which is assigned to its own subgroup within the broader An. funestus group  and the An. funestus subgroup might have evolved from a common ancestor based on the phylogenetic trees of ITS2, D3 and COI. It should be mentioned that An. rivulorum larvae are morphologically distinct from the members of the An. funestus subgroup  so it is not surprising that the molecular data should reflect this separation. The phylogenetic data for An. funestus-like in this study suggest that it is a distinct lineage from the other species in the group. These results support Spillings et al. showing this to be a new member of the An. funestus group. 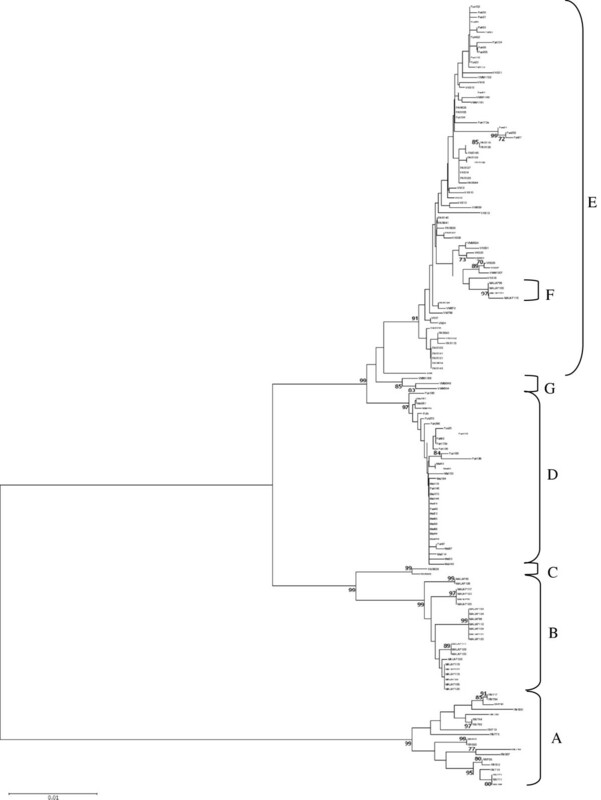 However, the phylogenetic trees from the concatenated ND5 and COI both showed two clades for An. funestus-like. Four An. funestus-like specimens were separated into their own lineage with the rest falling into the An. funestus subgroup lineage. Furthermore, two An. parensis specimens were separated from the main An. funestus subgroup lineage and grouped with the An. funestus-like lineage. Further molecular investigations are needed to test the hypothesis of new species in the group and determine the relationship between An. funestus-like and the two An. parensis individuals. In the study by Michel et al., samples from East Africa had significantly lower average heterozygosity (0.455) and allelic richness (3.9) across all microsatellite loci, and lower mean mtDNA haplotype diversity (0.773) compared with the rest of Africa (0.606, 6.0 and 0.924 respectively). Other studies [16, 35] have also reported two different subdivisions within An. funestus from the analysis of ND5. However, these proposed subdivisions were not correlated with the clades of Michel et al.. Analysis of the mtDNA cytochrome b gene and the ITS2 region in the rDNA  did not find any subdivisions within An. funestus. Previous studies using the RFLP method [17, 18] that included samples of An. funestus from 16 African countries, found evidence for five genetic subdivisions on the ITS2 and D3 regions in the rDNA but again these were not correlated with the Michel et al. clades. In the phylogenetic trees in this study, the results did not show clear phylogeny between An. funestus clade II, An. parensis clade I and An. vaneedeni in the An. funestus subgroup even though these three were separated clearly from An. funestus clade I. This undistinguishing relationship between the three species may reflect a selective sweep or non-discrimination due to recent divergence that is known to occur in the mtDNA . Surprisingly, An. parensis from South Africa shared two of the haplotypes, one with An. funestus from Mozambique and one with An. vaneedeni from South Africa. Donnelly et al. reported that shared haplotypes between species in the An. gambiae complex might reflect non-contemporary processes such as incomplete lineage sorting between species or historical introgression events. So, although no natural hybridization between An. funestus clade II, An. parensis and An. vaneedeni has been reported, mitochondrial introgression may have happened through a recent event. However, Green and Hunt  reported that cross-mating experiments between An. vaneedeni and An. funestus resulted in sterile male hybrids and asynapsis of the giant polytene chromosomes, two phenomena that occur regularly in crosses between species of Anopheles[11, 19, 40]. A more likely explanation, therefore, is that these shared haplotypes are ancestral. Although there were apparent subdivisions in the species studied here, these divergences may only be limited to mtDNA. The nature of mtDNA, i.e. haploid, maternal heritage and non-recombination, could retain both distinct mtDNA clades in admixed populations, while their nuclear genome would become homogenized. Michel et al. reported that there was no corresponding nuclear divergence in spite of deep mtDNA divergence between clades I and II within An. funestus. They suggested that the subdivisions may result from historical introgression either among previously isolated and divergent populations or with a related species . Additional research from other genomic regions is required to determine what these results mean in terms of specific status and relevance in epidemiology and to investigate their roles in malaria transmission in order to better understand the ecological aspects of this important vector group. Our findings indicate that five species in the An. funestus group comprises three lineages: A) An. rivulorum, B) An. funestus-like clade I and An. parensis clade II, and C) An. funestus clades I and II, An. funestus-like clade II, An. parensis clade I and An. vaneedeni clades I and II. This is the first step in the phylogenetic reconstruction of relationships between An. funestus-like and the other four common species of the An. funestus group, as well as between clades I and II of An. funestus. The study supports the conclusion that An. funestus-like is a new member of the An. funestus subgroup . Intriguingly, the phylogenetic trees of the concatenated ND5 and COI sequences showed that two subdivisions each for An. funestus-like, An. parensis and An. vaneedeni exist. Further investigations will be carried out to determine the specific status of the clades. In addition, further studies should also give insight into the roles played by the various species in malaria transmission. This work was supported by the Department of Science and Technology, National Research Foundation Research Chair Initiative grant to MC and the Hillel Friedland Fellowship to KSC. We thank the following for assistance with field collections or supply of specimens: A. Mabuza (Department of Health, Mpumalanga Province, South Africa); K. Hargreaves (Department of Health, KwaZulu/Natal Province, South Africa); T. Ledwaba (Department of Health, Limpopo Province, South Africa) and Prof R.H. Hunt (University of the Witwatersrand). Dr MJ Donnelly, Dr NA Dyer and two anonymous reviewers are thanked for helpful criticisms of the manuscript. KSC carried out the experiments and the analysis of the data and drafted the manuscript. MC and LLK designed the study, assisted with analysis of the data and helped draft the manuscript. All authors read and approved the final version of the manuscript.